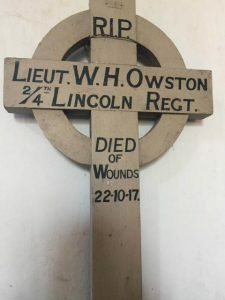 This returned cross is hung on the wall next to two plaques commemorating parishioners lost in both World Wars, and next to a beautiful stained glass window which was installed as a memorial to Sir Montagu Cholmeley, a local man who died in ww1. 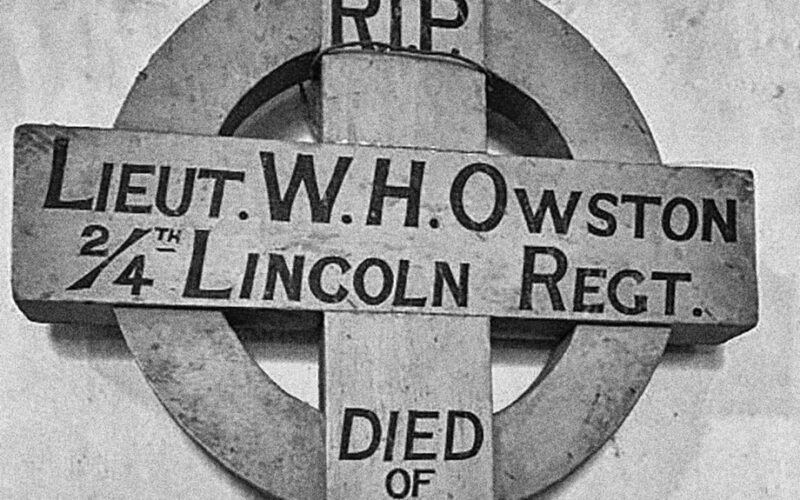 It’s incredibly likely that before he went to the Western front, Lt Owston was stationed in Dublin, putting down the Easter Rising. After that, his battalion moved to France in Feb, 1917. It looks like he was wounded at Paschendaele, then moved to a casualty clearing station nearby and on to a hospital. The regimental war diary states that they were supposed to be relieved by the Staffordshire regiment, but they were delayed and it was then he was shot. He died at Carency.